We share a responsibility for the health, safety and wellbeing of all staff and volunteers who work with us, people who use our services and anyone else affected by what we do. The basics include our health and safety policy, reporting accidents and incidents, our insurance cover, and equipment donations and purchases. Our risk management system ensures that everyone who takes part in your events and activities, visits your property, or uses your transport can feel confident that we take their health, safety and wellbeing seriously. Safeguarding means making sure adults with care and support needs, and children and young people under the age of 18, in contact with the MS Society, are protected from abuse. We all have a duty to report safeguarding concerns to a member of the Safeguarding Responders Group. 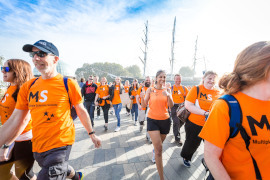 Disclosure checks help us to make safer recruitment decisions by identifying people who shouldn't have roles that involve contact with children or vulnerable adults; this can include adults with multiple sclerosis (MS) when they take part in certain activities. Personal care is the support a person needs with the activities of daily living. People attending your group services may have personal care needs. Lone volunteering is when you meet a person, enter a new environment, or travel alone as part of your volunteering role. You may be asked to meet with a person face to face as part of your role, but you must never make a home visit alone.